Goggles you can buy for 100 tickets via the Brewfest event which will change all players and NPCs into Gnome models for Alliance players, similar to http://www.wowhead.com/?item=34008 for Horde. Except make everyone look like Gnomes. "Goggles you can buy for 100 tickets via the Brewfest event which will change all players and NPCs into Gnome models for Alliance players..."
Simpsons reference... *Sigh* Uncultured youth.
" We might be reevaluating the duration. A hotfix has been applied that removes any duration on the goggles, and they are now permanent. However, until the next full patch release the duration timer will continue to display on the item, even though it has no impact on the permanence of the goggles. They now last FOREVER! Woot! I grabbed a pair of these today. Equipping them applies the buff Beer Goggles, which does make every humanoid except yourself appear to be male gnomes. You appear as your own race and gender. Players appear to be wearing their normal gear, but humanoid NPCs are limited to a select set of outfits. These have been hotfixed, and are now an permanent item! The effect only works on humanoids -- and not all of those. The Brewfest Revelers, for example, don't change. Perhaps they're actually booze elementals or something. There is a funny bug involved in these goggles. The beer goggles affect EVERY humanoid exept dwarven/human/forsaken/tauren/orcish/goblin/troll(?)/gnomish(? )/night elf/blood elf/draneic commoners, brewfest revelers,moonkins and yourself. Each time you (un)equip the googles, all the characters that are transformed will glow in a whitish light, which WILL be seen through walls and such, making it a kind of "wallhack" as it will (for 1-2seconds) show you each and every target being transformed within sight. My biggest lol has been seeing the spirit healer as a gnome. That is all. Used this in Gruul a little while back (note: Not recommended for tanks or guilds still learning the encounter). Seeing a giant, growing gnome... pure win. When using these goggles, other players have different gnome appearances. And the appearances seem permanent and unaffected by class/race. In addition, long term use showed that the same players would always keep the same appearance even after logging out for days. So my conclusion is that players gnome version are in fact altered by the already present appearance options. Although i do not know yet exactly how it affects the gnome model. For example: A human male with white hair will have black hair as a gnome. Is it possible for horde to get the gnome ones? Also, and this makes sense when you think about it, all people, male or female, become male gnomes. Unequipping and reequipping the goggles causes some NPCs to change gnome appearances. Makes everyone look like gnome, only effect humanoids. 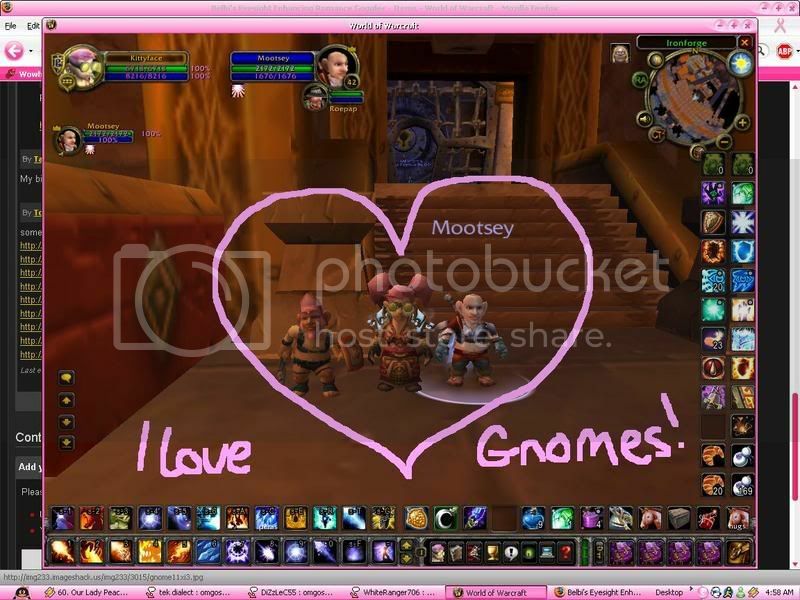 Why the Brewfest revelers are immune to the gnome transformation effect of the BEER goggles. Why do some NPCs with no helmet suddenly turn into a gnome with a helmet like the Stormwind guards'? Haha! I'd love to see a picture of Gruul's when wearing these goggles. Now in pvp this might not be the best idea to put it on. In WSG my entire guild made a premade and we all decided to put the goggles on... We got REALLY confused as to who was horde and who was alliance. Luckily we realized fairly quickly how to figure this problem out, the names of the players. This is a pretty epic item. These now cost 100 Brewfest Prize Tokens. I always wanted to have my own gnome city and now every city is a gnome city! Sorry I know this is posted to late but these are perfect for Bank Pimping, the goggles are way cooler than http://www.wowhead.com/?item=34827 - Noble's Monocle. I am really sorry that I didn't post this comment earlier for u Bank lovers. You don't get any XP from the daily quest you can pick up at lvl 1. From experience. Seeing a Gnome turn into a Boomkin is quite scary. These are a must if your computer chugs in Dalaran. Throw them on before you hearth, switch them out when you take off. Seeing how it's description is used twice, it's highly likely to be a reference to a side-effect of alcohol: Double Vision. If you wear these while doing Fumping, the sand gnomes you might summon are instead random races. Oh, I am SO trying these things out on Arthas! Ever seen these in Trial of the Gnome? Er, champion. What... What have they done to you, Tirion? -Black Knight killing a (now) random gnome. =D There was more, such as the actual pic of Jaina Proudgnome and also Argent Gnome Paletress, but they weren't that great. Such as today, I was grinding Ogres in Nagrand for Kurenai rep and well... it was rather hilarious seeing Gnomes larger then my character. Does anyone know if the clothes the gnomes wear are actually in game? Rate down if you want but i really gotta say this... THEIR OVER NINE THOUSAND! Okay..My first joke..probably not the best ..and also a little misunderstanding, ment to put this comment on the horde's item.. oh well. I found the BEST use for these ever! If you put them on, you turn everyone into Gnomes! Including, wait for it...WORGEN! Put these on and you'll no longer hear that disgusting snuffling from the Worgen standing around you in the Bank and Auction House because...Gnomes dont snuffle! Dig these out of your vault and keep em in your bag. You'll be glad you did! I have these on my bank alt, and the real win with this piece is that I get a line of sight on the mailboxes in SW plaza. No ginormous cartoons blocking the box. Plus, it's good for a cheap laugh. Has anyone tried this on Lich King ? I'm Alliance, and would much rather see female Draenei/Night Elves than male gnomes. Hell, I'd rather see female Orcs than that. These goggles do not make the Ancient of War into giant gnomes anymore. They are just normal sized gnomes. I would assume they same for Gruul. But not sure. I wonder if this turns dragons into gnomes. Lol.. flying dragomes. Also, the goggles don't work in the Molten Front for some unknown reason. Just used this in Goldshire. And....yea..
Are these transmogrible ? please help me? This vanity item turns Bad Juju 's procs into male gnomes too.Pretty much every humanoid npc,player,trinket proc,guardian etc will be gnome male. If these goggles are used in your Garrison, it turns your Command Table into a floating gnome. "Guaranteed by Belbi Quikswitch to make EVERYONE look attractive!" Please make these cosmetic so they can be transmogged! Seems to have funny effect on Class Hall's Scouting Map. For whatever reason these goggles turn the Legionfall Construction Table at Deliverance Point into a Gnome as well! And it talks! Equip: Guaranteed by Belbi Quikswitch to make EVERYONE look attractive! This item will be converted to Blix's Eyesight Enhancing Romance Goggles if you transfer to Horde.